Not surprisingly, one of the more popular topics on this blog is the subject of income for doctors. We have recently written about how much an Intern is paid and how much a Resident is paid. Of particular interest to many is how much a doctor earns when they have completed all their training and achieves the status of a Surgeon or a Physician or a General Practitioner or one of the many other specialties in Australia. A recent report from the Australian Tax Office has confirmed that doctors in Australia are amongst the best paid in the country. If we take our entry point as internship and our peak point an Australian surgeon. Then a good guide as to how much one can earn as a doctor in Australia is somewhere between $68,000 AUD and $395,000 AUD per annum. 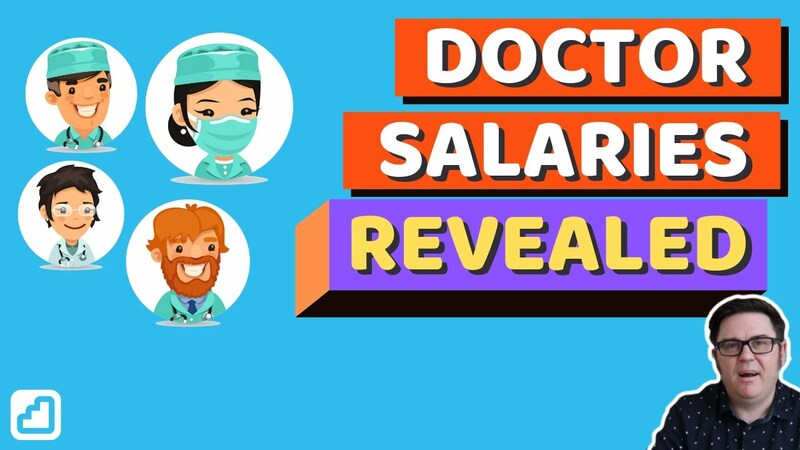 Of course not every doctor will earn $395,000 per annum and there are many factors that affect the earnings of a doctor. And a number of doctors also earn even more than $395,000. Let's dive into the earnings in a bit more detail and also look at some of the cost factors for doctors. Surgeons, Anaesthetists, Physicians, Psychiatrists and ‘Other Medical Practitioners' Amongst the Top Ten Earners in Australia. What is impressive is that 5 of the ten top occupations by earnings come from the medical profession, with Surgeons leading with an average taxable income of $394,866, followed by Anaesthetists in second with $367,343 and Internal Medicine Specialists in third with $299,378. Psychiatrists are in fifth with $216,075 and ‘Other Medical Practitioners' in sixth with $204,387. This is even more impressive when one considers that the ATO lists around 1,100 occupations to select from when one compiles their tax return. You have probably already spotted one potential problem with these figures, which is that they rely on the person completing the tax return to select the appropriate occupation. The other possible occupations for doctors to choose under the ATO categories are: General Medical Practitioner and Doctor specialist – type not identified. Both of which earned about $140,000 AUD per annum in 2016/17. Presumably most surgeons select surgeon for an occupation and anaesthetists select anaesthetics etcetera. However, its not clear what occupations trainee doctors select. Most will likely select “Other Medical Practitioner”. Some may select the specialty that they are training in and this will reduce the overall average as trainee doctors earn less than specialists. There were 28,307 doctors who selected “Other Medical Practitioners” in 2016/17, versus for e.g. 3,951 for Surgeons, so this number would incorporate most of the trainee doctors in Australia. But it might also be joined by for e.g. Emergency Physicians and Obstetricians and Gynaecologists, who don't have another obvious occupation to select. Not many doctors selected Doctor specialist -type not identified (only 37). In any regard its fairly plausible to say that trainee doctors are also in the top ten earners in Australia. And this certainly stacks up when one considers the publicly available information about trainee doctor salaries in Australia and one factors in overtime. The average of these salaries will also be influenced by doctors working part-time and doctors working in the public sector (although as we show below by not too much). Some interesting information is discerned when one digs into the detail provided by the ATO. So what we notice here is that there is a very low level of average salary or wage income compared to the actual salary. This likely reflects the fact that many specialists do not earn the majority of their income as a paid wage but rather through contractual work and Medicare and private billings. Is There a Difference Between Public and Private Earnings? In short. Yes. But what we see when we compare the above average taxable income with some of the rates that Specialists are paid in Australia for working in the public hospital system is something quite comparable. First, let us look at Staff Specialists. These are Consultants who are employed on a salary basis in NSW hospitals. Generally, they work full time in the hospital system and don't work in the private sector. They may, however, see some private patients within the hospital system for which there is sometimes the capacity to share in part of the revenue. A first-year Staff Specialist working full time will earn a minimum of $234,556 if they do not see private patients. So we are already above the average taxable income of a Psychiatrist. This income can go up to $342,060 if the doctors sees a large number of private patients and splits this revenue with the hospital. Going past the average taxable income of Physicians. The staff specialist rates increment every year until year 5. Once you have worked as a Staff Specialist for 7 years you are eligible to apply for Senior Staff Specialist status. At this point, you will earn a minimum salary of $316,891 and a maximum salary of $462,133. At this point, the Specialist is on par with the average taxable income of a Surgeon. Add to this a generous professional development allowance of up to $35,000 and the possibility of a managerial allowance of an extra $9,000 to $23,000 for being the head of department or such. Being publicly employed is a well-remunerated experience for specialist doctors. Visiting Medical Officer is the term given to a Specialist that contracts their services to a hospital. There are various ways that this occurs but lets stick with the most common one which is a sessional rate which is paid on an hourly basis. Again sticking with NSW, a senior surgeon on a sessional VMO contract will earn $234.75 per hour plus $46.55 for background practice costs. That's $281.30 per hour. Were that surgeon to work 40 hours per week, just for the hospital for 48 weeks a year. That amounts to $540,096 AUD per annum. So about $80,000 more than what one could possibly earn as a Staff Specialist. Of course, VMOs don't generally just work for the public hospital system. They often consult from rooms and work in private hospital settings where they can generate greater revenue. But to bring it back to reality a little bit. Working as a contractor means that you are not paid for your leave. You do not receive a professional development fund. And you have to carry your own Indemnity Insurance. How Much Do Specialists Make Working in the Private Sector? This question is a little bit more difficult to answer. Because there are no real reliable sources of information other than the broad information provided by the Australian Tax Office. In addition, different specialists do different things. Some solely or primarily work in rooms, for example many Psychiatrists, General Practitioners and Physicians. Others work between rooms and hospitals, including most Surgeons and Anaesthetists. Even the costs of running rooms can be considerable. Psychiatrists tend to have the lowest costs as they generally just need a comfortable office, reception and waiting room and a small amount of equipment. Versus, for example, Obstetricians and Gynaecologists who need a large amount of equipment to perform their job in rooms. As we have also mentioned once you are in the private sector you are not just earning you are paying out expenses, which includes your own wage as well as the staff you employ, rent, various insurances, your own costs of professional development. Also, when you go on leave you don't get paid. But your staff generally do. That being put aside we can do some rough estimations. I'm going to use my own background specialty of Psychiatry for a simple example. Lets say I work as a Psychiatrist solely in private rooms and charge patients for either half hour or 1 hour sessions. If I apply Australian Medical Association rates (which most specialists in private do). And I saw 4 patients for an hour and 8 patients for a half hour every day for 5 days a week for 47 weeks of the year (4 weeks leave and some adjustment for public holidays). I would generate around $3,100 AUD in fees per day OR about $730,000 AUD per annum. This could go up somewhat if I charged for different items OR engaged in writing medico-legal reports. This seems a lot and its and it is. And it doesn't take into account all the costs I mentioned above. Question: How long does it take to become a Specialist in Australia? First, you need to go to medical school which is generally a minimum of 5 years for an undergraduate program. After graduating you then complete one or two provisional years which are called intern and resident years. You then apply for specialty training which in some cases is quite competitive (for example surgery) and therefore may take several years to get in. Most specialty training is a minimum of 5 years. Although General Practice training can take as little as 3 years. So from entering into medical school to becoming a specialist may take you a minimum of 9 years but is more likely to take you about 12 or more. For part of this time you are at medical school, incurring debt and with limited scope to work. But as we have pointed out above once you enter the hospital system you start to earn a decent wage helping you to pay off those debts. As a trainee you are probably already in the top ten of earners in the country. But you will have significant costs in terms of paying for your training. Exam fees and College fees tend to be in the several thousands of dollars. And you will be making this money partly due to working long hours. Question: How much tax do Specialists pay? Answer. This obviously depends on the Specialist and how much they earn. In Australia there are quite a few deductible expenses. So doctors are generally able to deduct things like equipment, insurance, college and exam fees, medical board fees even sometimes travel and accomodation. This will reduce the taxable income somewhat. Also many doctors who work privately will establish companies or trusts through which they collect some of their earnings. They may leave some of this money in these entities paying a lower corporate tax on the profits than if they were to pay themselves. If we create an example of a full time Senior Staff Specialist in NSW who is not earning additional from their private billings. And has $20,000 in deductible expenses. They will have a taxable income of $296,891. Assuming that they have already cleared their university debts and have private health insurance, so don't need to pay a medicare levy. Such a doctor would pay $106,860 in tax. Question: How many doctors pay tax? Answer. A fun fact is that if you count up all the doctors who filed a tax return according to the ATO figures there were 80,482 tax returns filed by doctors in 2016/17. This post was compiled with acknowledgement to the Australian Taxation Office for some of the information in this post. Career Coaching Canberra: Looking for a Doctor Coach? Things to consider when looking for an interview coach for doctor interviews and other career challenged include experience and training, as well as panel member experience. PLAB Australia. Is it an Alternative to the AMC Exam? PLAB Accepted in Australia? For a Small Number of IMGs Who Have worked Previously In the UK. Completing the PLAB Is an Alternative to the AMC Certificate. What Can You Earn Working For Public Hospitals? This post was compile with acknowledgement to the Australian Taxation Office for some of the information in this post.